That said, yesterday’s Environmental Lobby Day in Olympia was a rousing success. More than 500 Washington citizen activists showed up to talk with their Senators and Reps about issues like offshore oil, 100% clean, renewable energy, orca recovery and marine plastics. It feels like it could be a good year for progress on these and other serious issues, given the apparent willingness of lawmakers to explore other ways of resource use and conservation. We’ll see. 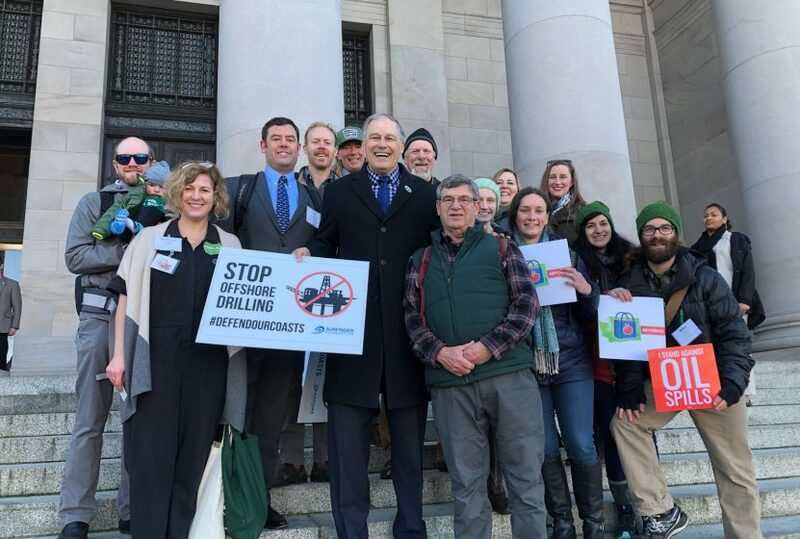 One guy who’s all in is Governor Inslee, seen in the above photo posing with our delegation on the Capitol steps. He’s running for the executive position in the other Washington and progress on these and other environmental issues affecting the Pacific Northwest will be a big part of his campaign. Making this the year where, if things are going to get done, Washington is poised to lead the way.